Union Minister Uma Bharti recently became a victim of selective misquotation by Media. On Wednesday the senior BJP leader and former Madhya Pradesh CM were reported addressing to the public while she made some remarks on eating at a Dalit’s home. Media houses like Times Now, DNA and CNN News 18 chose to mention only a part of her statement and even misquoted her in their reporting of the statement. DNA report claimed that Uma Bharti has stated that eating at Dalit’s home won’t ‘cleanse’ them. The CNN News 18 report claimed that Uma Bharti has stated, “I am not Lord Ram, I cannot purify Dalits”. The Times Now report stated that Uma Bharti has said that we are not Lord Ram and us having food at Dalit homes won’t make them pure and pious. People soon started to brand this as anti-Dalit mentality and started equating this with a recent incident where BJP MLA was seen having food at a Dalit home but later the homeowner had claimed that the food was not cooked but ordered from outside. Even Times Now itself had aired the video clip where Uma Bharti was making the statement. She was reportedly speaking at a Smajik Samrasta Bhoj organised at a village in Naugaon. Samajik Samrasta Bhoj are mass meals events organised by BJP and RSS leaders aimed at propagating social harmony. Dalits and non-Dalits sit down to eat together in these events. 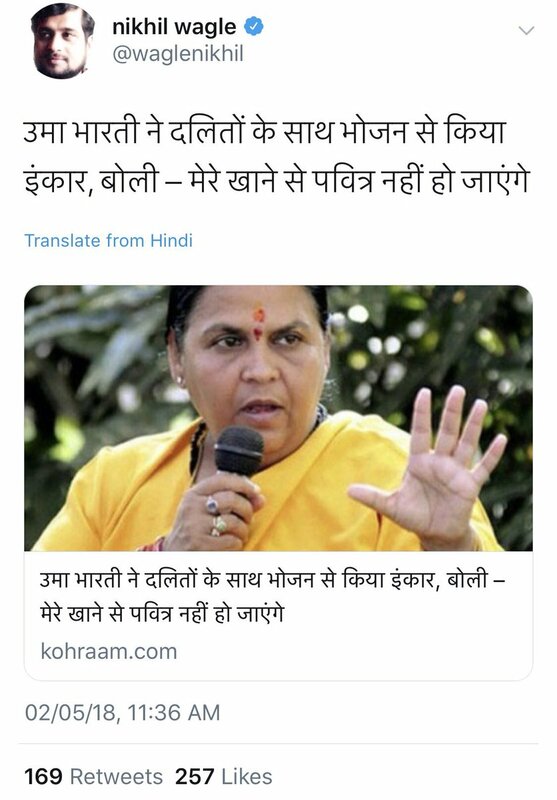 As any Hindu will immediately understand, Uma Bharti was referring to the incident mentioned in Ramayana, when Lord Ram accepted berries from the hands of the old Shabri after she tasted them for sweetness herself. The minister clearly states that we are not Lord Ram, she meant that we are mere humans and we will be purified when Dalits grace our home to dine with us. When understood the context, it was indeed a genuine and beautiful sentiment expressed by the minister which News channels chose to twist it in their headlines. While the body of the articles does have the entire statement and context, the selective quoting and twisting is understandably an attempt to stir controversy when there was none. There have been numerous incidents like this in the recent past when BJP leaders are selectively quoted or misquoted to generate controversy. Caste discrimination stories are the current media favourite. We have seen how the simple issue of plate segregation at a hostel in IIT Bombay was twisted into a casteism story and how the case of the murder of a young man in Gujrat was twisted to show that he was killed for ‘daring to own a horse’. Many of such fake narratives by the media have been busted recently. Digital media is a powerful weapon and we are living in times where false news can travel fast and can be used by people with vested interests to create unrest in the society. The Bharat Bandh violence across the country is a grim reminder of the fact. The false news that the government is abolishing reservations had stirred unrest and driven people to violence. One wonders why national media houses have a tough time sticking to facts while quoting someone. Given the fact that The Times Group had recently themselves been a victim of fake news circulation when some miscreant altered their headline and doctored images were circulated in the social media, due diligence and avoidance of misleading headlines are expected from media powerhouses. Javdekar claimed that BJP would get a landslide victory by getting more seats than it won in the 2014 Lok Sabha elections and that the NDA would get two-third majority in the elections.